Contact us for help choosing the correct filter. We carry the full line of Yi-Shan and Jupiter-AlkaViva-Emco water ionizers and replacement filters, even if not listed. AlkaViva H2 water ionizers double filter packages for Vesta H2, Athena H2 and Melody II water ionizers. 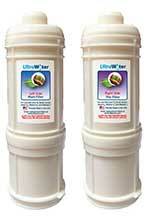 These high-hydrogen water ionizers have TWO on-board filters for optimal filtration. The Alka Viva ULTRA water filter is the best there is - even removes pharmaceutical drugs and heavy metals! AlkaViva H2 water ionizers double filter packages for Vesta H2, Athena H2 and Melody II water ionizers. These high-hydrogen water ionizers have TWO on-board filters for optimal filtration - the ULTRA filter and now a fluoride filter. AlkaViva Cleaning Filter for Alka Viva Vesta H2, Alka Viva Athena H2 and Alka Viva Melody II - easy to use and safe citric acid cleaning filter! This .1 micron Biostone Plus filter contains Granulated Activated Carbon, which is an extremely porous material. For enhanced convenience in filter replacement, the spring-loaded filter housing makes it a snap to replace your filter. It also contains Tourmaline, which slightly ionizes the water before it reaches the electrolysis chamber. For use in the all Jupiter/AlkaViva water ionizers (except Vesta), including the Venus, Microlite, Melody, Orion, Aquarius, Delphi, Athena, etc. This .01 micron Ultra Biostone filter is a top quality, 9 step filter. Premium filter materials ensure production of healthier and cleaner water, trapping a wide variety of contaminants while allowing beneficial minerals to pass through. It contains Granulated Activated Carbon, which is an extremely porous material. It also contains Tourmaline, which slightly ionizes the water before it reaches the electrolysis chamber. For enhanced convenience in filter replacement, the spring-loaded filter housing makes it a snap to replace your filter. For use in the Venus, Orion, Delphi, Microlite, Melody and Aquarius Jupiter/AlkaViva/Emco Water Ionizers. Will fit all Emco (AlkaViva) ionizers except Vesta, AlkaBlue and Technos. This eco-conscious filter contains Activated Carbon Fiber (superior to granulated carbon) and is an extremely porous material; therefore it has an enormous surface area for contaminant absorption. Under an electron microscope, Activated Carbon Fiber looks like a porous bath sponge and the one pound used in our filter has the equivalent surface area of of approximately 150 acres (over 3 football fields)! For use in the EC450, EC550, SP350, SP550, SP750, AQ300, AQ500 and the AQ700 Yi Shan water ionizers. Replace every 5-7 months. Eco-friendly replacement cartridges for the YiShan replacement filter that fits the EC 450, EC 550, Ionic Oasis SP 350, SP 550, SP 750, AquaTonic AQ 300, AQ 500 and AQ 700 YiShan water ionizers. This filter contains Activated Carbon Fiber (superior to granulated carbon) and is an extremely porous material; therefore it has an enormous surface area for contaminant absorption. Under an electron microscope, Activated Carbon Fiber looks like a porous bath sponge and the one pound used in our filter has the equivalent surface area of of approximately 150 acres (over 3 football fields)! For use in the Conduit, Aqueduct and Catalyst EP series water ionizers, the Genesis, Oasis and Aquarius Rejuvenator water ionizers and the EP400, EP600, EP800 and EP1000 Gold Fox Water Ionizers. Clean your water ionizer annually to keep it good as new. Our customers receive instructions on the method. Citric acid does the work! GREAT for cleaning Water Ionizer Sticks too!